Holiday Bonus Survey: 78% Will Offer Some Sort of Year-End Gift | Challenger, Gray & Christmas, Inc. 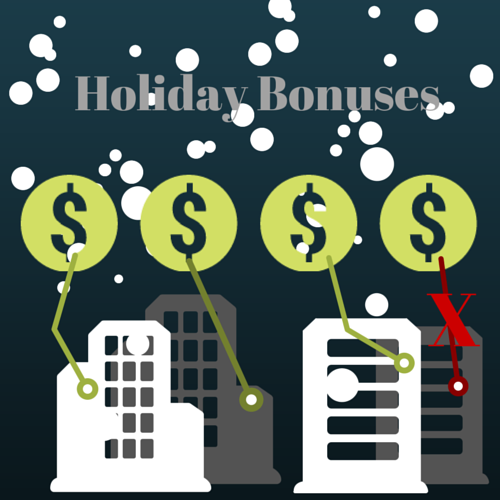 In the survey, 78 percent of respondents said their companies are offering a year-end gift/bonus. That was up from 53 percent a year ago, according to global outplacement consultancy Challenger, Gray & Christmas, Inc., which conducted the non-scientific survey among approximately 100 human resources professionals in November. About half of the companies awarding bonuses plan to give traditional monetary bonuses based on company, departmental, and/or employee performance. That represents an improvement over last year, when just 44 percent gave out traditional bonuses. The other 50 percent of this year’s survey respondents said their companies are handing out smaller monetary or non-monetary gifts, typically valuing less than $100. These might include gift cards, cash, or some type of actual gift. “Employers across the country have picked up the pace of hiring this year. As the pool of available talent gets shallower, it is critical that companies not overlook the importance of retention. The need to keep the talent they already have, is undoubtedly a driving factor behind the increased percentage of employers awarding year-end bonuses,” said John A. Challenger, chief executive officer of Challenger, Gray & Christmas. Another factor helping to fuel year-end bonuses is the fact that after-tax corporate profits continued to increase in 2014. In the third quarter, corporate profits reached a record high of nearly $1.9 trillion, according to the latest data from the U.S. Bureau of Economic Analysis. With profits on the rise, about 22 percent of survey respondents said their companies were upping the amount of year-end bonuses. However, most employers (77 percent) plan to keep bonus levels on par with last year. “Those getting a bump in their bonus check, should not expect to see a Wall Street-like figure when they open the envelope. Last year, Wall Street bonuses were up 15 percent to an average of more than $164,000, according to a report from the New York state comptroller. That average will likely increase again this year, thanks to a strong stock market,” said Challenger. “Despite the lack of six-figure Wall Street-like bonuses, most employees still appreciate the year-end bonus. Mostly, they want to know that their hard work is recognized and appreciated. Many workers would be happy with a $50 gift certificate to a local restaurant or store. Many would probably be happy with an extra day or two of paid vacation at the end of the year. “As the economy keeps improving and hiring continues to accelerate, employers may have to up their game when it comes to year-end awards. The number of cities with unemployment rates below 3.0 percent is growing every month. At that level, it becomes increasingly difficult to find skilled labor and the odds of employee poaching go up exponentially. In these environments, companies will be forced to greatly expand their retention efforts,” said Challenger.